First of all you can not accomplish a strength-training or weight-training program without knowing two terms: rep and set. Rep (repetition) is one complete motion of an exercise. A set is a group of consecutive repetitions. 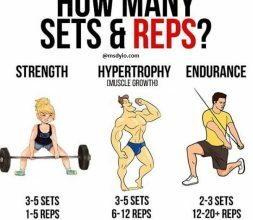 The number of reps you should do depends on where you are in your training and your goals. and for endurance 2-3 sets, 12-20 + reps and 30-75 sec rest. Be sure to adjust the amount of weight you use for each exercise. In general, use more weight to work larger muscles like your thighs, chest, and upper back, and use less weight to exercise your shoulders, arms, and abdominals. Most people can increase their initial weights after two to four weeks of training; at that point, consider adding a second or even third set for each muscle group. If your goal is simply to build enough strength for good health, one challenging set it’s sufficient.